Upper: Spacer mesh, synthetic Tirrenina Suede overlays. Midsole: Boost foam with hard EVA rim. 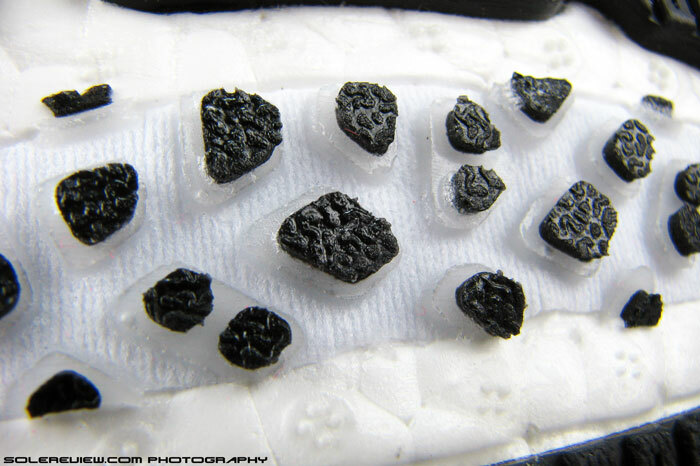 Outsole: Carbon rubber, Adidas Quickstrike under forefoot. Widths available: Only one standard width. The Boost midsole carries over from last year's Adios Boost 1, but the upper is a redux of the 2012 Adiprene based Adios 2. Responsive heel and firm forefoot make for a great ride, but the tongue design leaves something to be desired. Responsive ride, strike economy, ventilation, weight. We observed the low-drop, minimalist footwear phenomenon of 2009-2012 with interest, and one aspect of it was truly puzzling. Driven by the meteoric (and temporary) success of brands like Vibram, it was natural for many brands to want in on the wave. A new category of lightweight shoes mushroomed almost overnight, each model marketing a low heel drop number and overall minimalism in construction. But hang-on a sec there, weren’t traditional racing flats the exact same thing? Lightweight, snug fit, low drops, the works? Some racing flats successfully slipstreamed off the minimalist wave, but other than that, only the new ‘minimalist’ models marketed by brands hogged prime-time. Can’t really seem to get our head around it. One could argue that Racing flats have a narrower fit than mainstream low-drop shoes, but then you had options of different brands and fits which could take care of that. We remember reviewing the quasi-flat Adizero CS in 2008 (yes, we’ve been around longer than you think), and it actually came in a wide. Durability? Distance flats – then and now, came in different outsole designs, offering a broad spectrum of durability levels. Was it the price then? Not that either, because running flats have been (and are) available at below $100 prices. Regardless, running shoes broadly tagged as ‘flats’ have survived the crests and troughs of footwear trends. Because when it comes to putting some speed into your runs, few shoes do a better job. They weight less, have a low drop, and have a flat (and stiff) forefoot profile inclined towards producing efficient touch-and-go – a critical ingredient for making modern day homosapiens faster. In the racing flat context of things, the Adidas Adios has always been an in-betweener between running flat purism and mainstream neutrals. For the simple reason that heel is relatively generous in volume and cushioning, which makes it closer to a neutral regular, yet the flatter forefoot distances it from the latter. Adidas hasn’t published the heel drop for the Adios 2 Boost, but going by what online retailers say, general consensus plugs the Adios drop at around 10 mm. The Adios has always been so, even in its non-Boost avatar. You have to see where the Adios is coming from. It was a replacement for the Adizero CS, which combined elements of a traditional comfort shoe with that of racing flats, resulting in a middle-ground pace shoe. The Adios took that formula and refined it, making the shoe sharper functionally. Buoyed by the Boost momentum, Adidas decided to inject its newly concocted foam into the Adios last year, and 2014’s Adios 2 Boost is a follow-up to that. So what does this year’s Adios evolution bring? The sole unit is a carry over from the 2013 Adios Boost v1. The 2014 Adios Boost 2 goes back to simpler construction and materials, inspired by the 2012 Adios 2 (non-Boost). Adios uses the Boost foam. Read our Energy Boost 2 review for a detailed background of this technology. 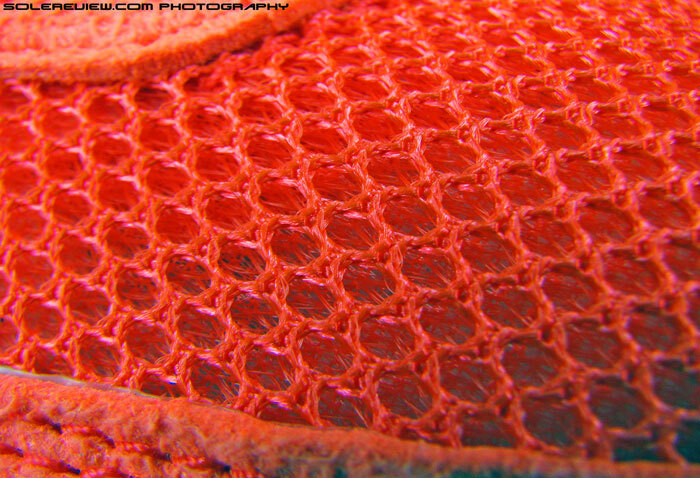 Lightweight, ultra breathable mesh, but the insides feel a bit coarse. You can’t go wrong by starting with the basics, so we’ll do exactly that. 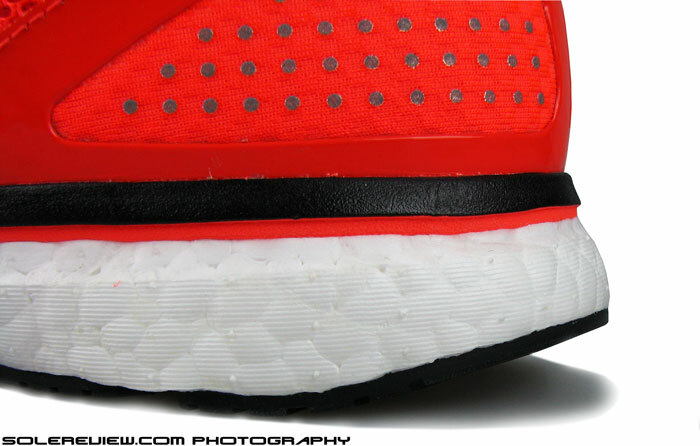 The sole unit is an exact carry-over from the 2013 Adios Boost, no changes there. 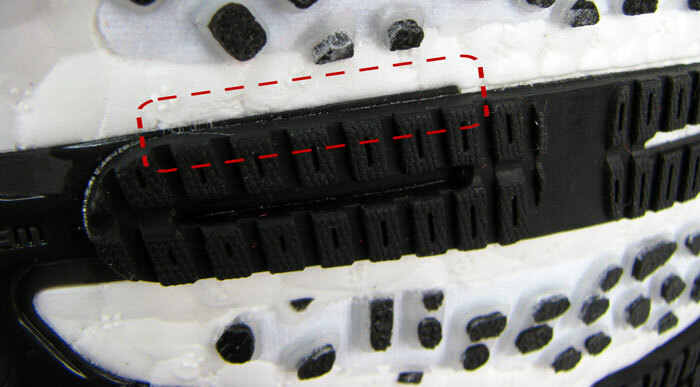 A near full length layer of Boost foam (see this review for a complete Boost lowdown), capped on the top with a harder EVA rim. On the upper, major changes take place, if you use last year’s Adios as a frame of reference. Adidas does away with the signature upper design language found in its Boost line up – things like the distinctly shaped heel counter pattern, mid-foot design and Tech-Fit-mimicking overlay on its toe box. Instead, it reverts back to the design and material fundamentals of the 2012 non-Boost Adios 2, bringing back soft synthetic nubuck and a much more simpler design. The mesh used is the same, a breathable lightweight type which runs across the upper surface without a lining underneath. Heel has a prominent bevel for smoother landings. 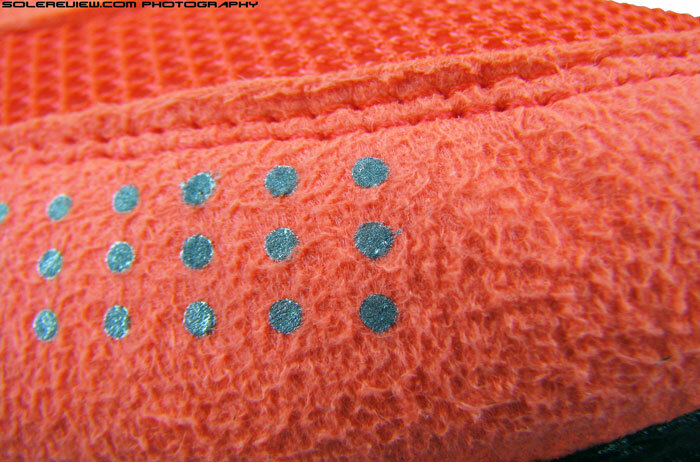 Fabric strobel between the removable insole and Boost foam. 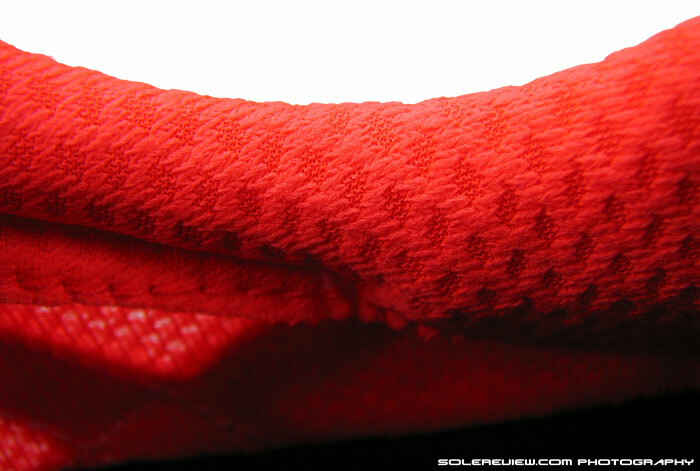 In the rear, edges of the heel synthetic fold under, and over the Boost midsole. When it comes to ride, the recently introduced Boost foam gives the Adios an advantage over its previous EVA foam versions. That difference is felt in its heel stack, which at approximately 25 mm, offers a lot of cushioning for a racing flat. But here comes the catch. At slower speeds, rear-foot strikers won’t find the Boost midsole very responsive; it is only when you pick up speed that the snappy nature of the foam comes into action. A glancing heel strike will momentarily cause increased compression of the Boost foam globules, unlocking the cushioning sensation found lacking at lower velocities. 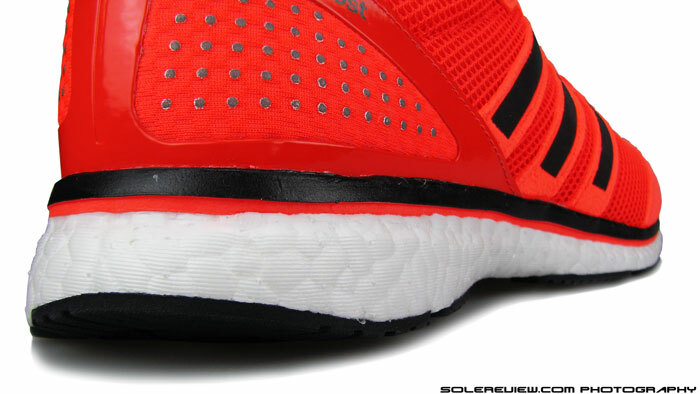 What we like about the Boost is that it doesn’t make the heel mushy or wobbly, keeping the foot stable. It also helps that there’s this extra hard ‘rim’ of EVA capping the outer upper edges of the midsole. 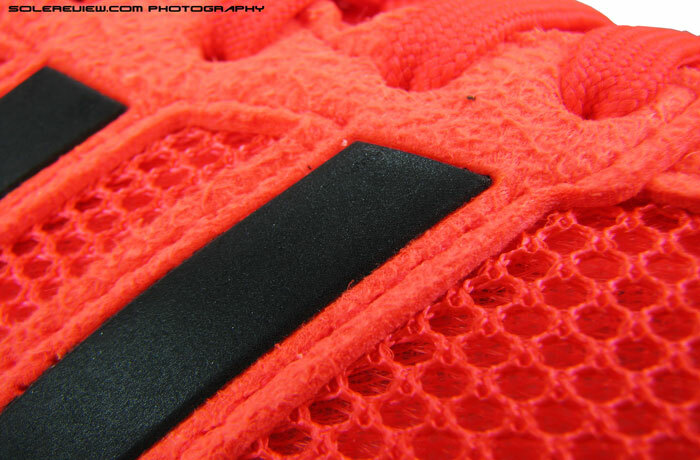 It is not a layer between the Boost foam and foot, it limits itself only to the periphery. What’s above the Boost midsole is a thin fabric strobel and a drop-in sock-liner, with edges of the heel counter synthetic folding in over the Boost foam. We’ve drawn some markings over the forefoot to show how the plastic Torsion shank extends itself. 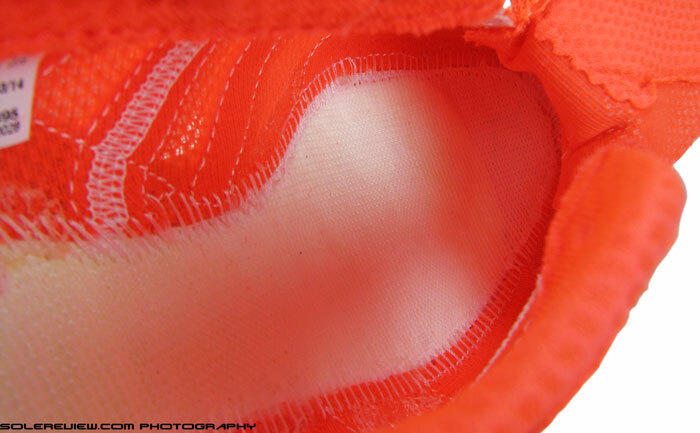 In this close-up shot, you can see a portion of the plastic shank below the forefoot rubber. Forefoot is very slim (hence the high heel-to-toe drop differential), so there’s close-to-none cushioning there – at least not the type you can feel. It is a bit stiff too, and flexing it results in a spring-back sensation. There’s a reason behind this; the plastic ‘Torsion’ thing located in middle of the outsole doesn’t restrict itself to just that area. Its invisible ‘fingers’ stretch forward into the forefoot, with the medial (inner) and lateral (outer) extensions spanning the entire length of forefoot. We’ve edited a picture (above) with the red section showing the reach of plastic bands. It isn’t a new thing though. It was there in last year’s Adios and even in the non-Boost Adios 2. The Adidas DSP (Dual Stencil Process) Quickstrike. Small pieces of rubber are glued on to TPU bases. And that is attached to a fabric base, which in turn is pasted on the midsole. Stiff the forefoot might be, but that’s exactly what makes fast running in the Adios Boost 2.0 so rewarding. With not much material to ‘give’ or compress under the forefoot, propulsion just feels so much more economical. Great touch and go, and it is helped by the racing flat specific ‘Quickstrike’ outsole. 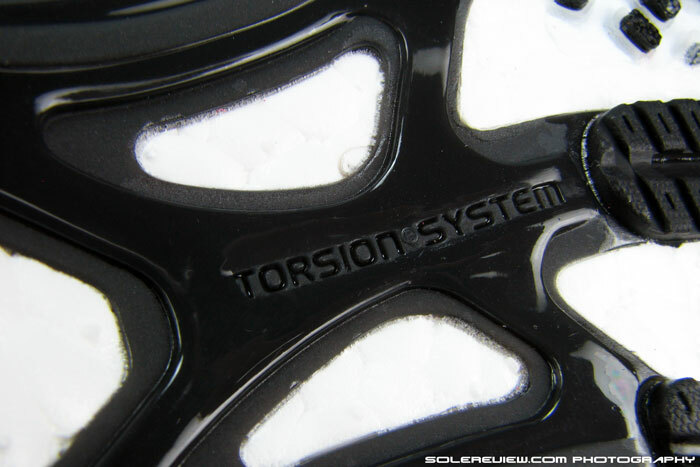 Found in many high end racing shoes, small pieces of rubber are glued on to many TPU (Thermoplastic Urethane) mini-platforms, which in turn are affixed to a fabric base. This whole assembly is stuck to the underside of the midsole, with the basic purpose of reducing weight, yet providing excellent grip. The Adios Boost comes shod with Continental branded rubber. Talking of grip, the Adios really comes into its own on synthetic tracks. The Quickstrike forefoot rubber nuggets feel like an embryonic version of 3/16” Omni Lite Xmas tree track spikes, and works amazingly well. We saw the Adios perfect for those intervals, where you need the forefoot grip to be tenaciously grippy during quick accelerations, yet want the shoe to be somehow well padded when you’re catching up. 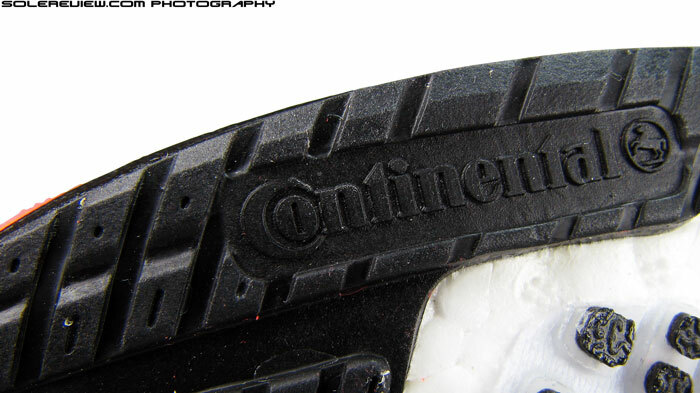 Wish the entire forefoot had these nubs, because the band of Continental rubber in the center feels kind of lumpy. On the other hand, the liberal use of Continental rubber increases durability. The injected rubber micro-lugs aren’t very hardy, and will see quicker wear if used on road often. The rubber running along the forefoot center eases off the abrasion pressure on the Quickstrike, making the Adios a little more capable of taking a greater number of training runs. On roads, the durability isn’t as bad as we thought it would be. The rear-foot wear levels equals the Energy Boost, with plenty of outsole rubber coverage. In the forefoot, moderate wear shows up on the Quick-strike lugs after a few runs, with rest of the regular rubber coming unscathed. The micro-lugs have this glossy finish on the top, and that is the first to go – they have the appearance of dried-up rice starch flakes, but they’re purely cosmetic and do nothing to impact traction performance. We feel the Adios (or for that matter any distance flat) should be weaved into a training rotation, with a frequency of 1-2 days a week being optimum. It has enough cushioning to be a daily trainer, but forefoot lugs might not take that abuse. There’s a pattern to the outsole wear though; as the forefoot center is raised relative to its sides, signs of wear (on both the quick-strike and rubber area) will first show up somewhere around the middle. It’s also likely that the snug upper fit focuses forefoot pressure on a smaller area instead of spreading it out, which might lead to wear just under the roll-off pressure zones. The upper might support the arch, the midsole does not. The hard (black) edges extend upwards under the arch, and causes mild dig-ins. 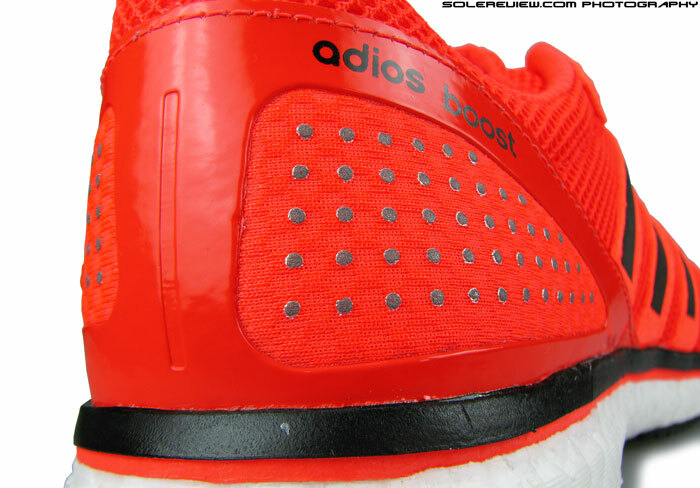 One shortcoming of the Adios Boost 2 midsole will be made apparent if you’re a low arched runner. 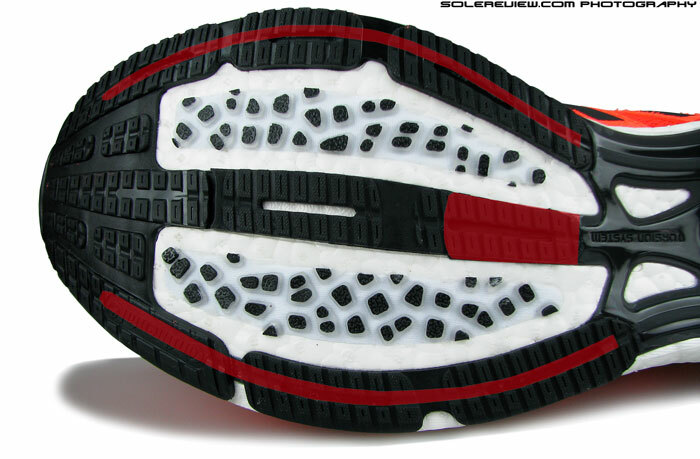 The midsole waist (area above the Torsion shank) is very narrow, as befits a running flat. That isn’t a problem in itself, but the firmness and angle of midsole wall is. 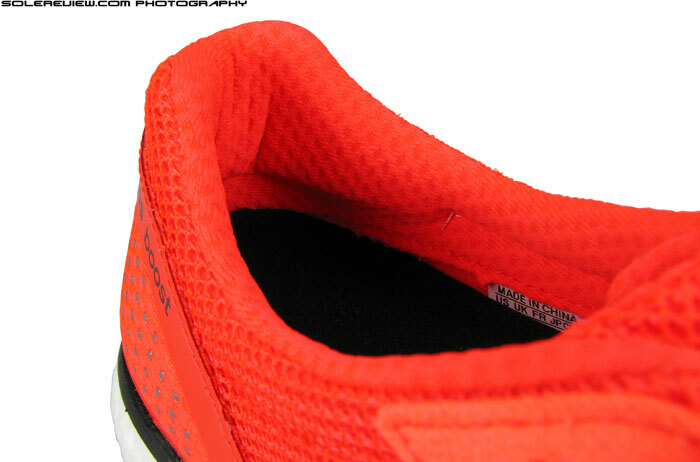 The rim lining the Boost foam is rather firm, and its hard edge shoots up as a straight line right below your arch. So start putting miles on it, and if you tend to load weight on that area, a faint soreness will make itself felt under-foot. It isn’t acute, but that’s something you should watch out for. And if you’re prone to PF injuries, it would be healthy to cross the Adios Boost 1 and 2 completely off your list. It’s a small risk, but why take it? We think it rather strange that Adidas should overlook this. In the regular EVA Adios 2 version, the under-arch midsole area curved out nicely, so it wasn’t a problem. The material was also way softer, unlike the hard rim used in Boost Adios. There is a foam sockliner between the hard rim and the foot, but it only provides marginal insulation from the hard edges. 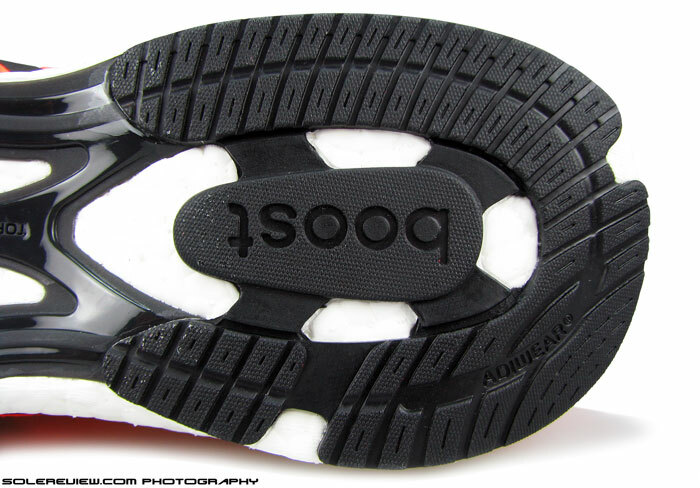 The 2014 Adios Boost 2 sockliner’s design is unchanged from 2008. See picture below. 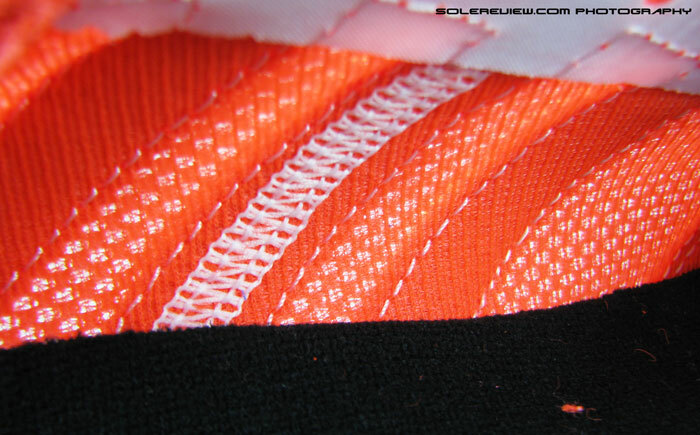 From solereview archives: The 2008 Adizero CS and its sockliner. Notice that latter is the same as used in this year’s Adizero. A hand-me-down over an entire generation of Adizeros. The sockliner, by the way, is a straight lift from the 2008 Adizero CS (yes, 2008). 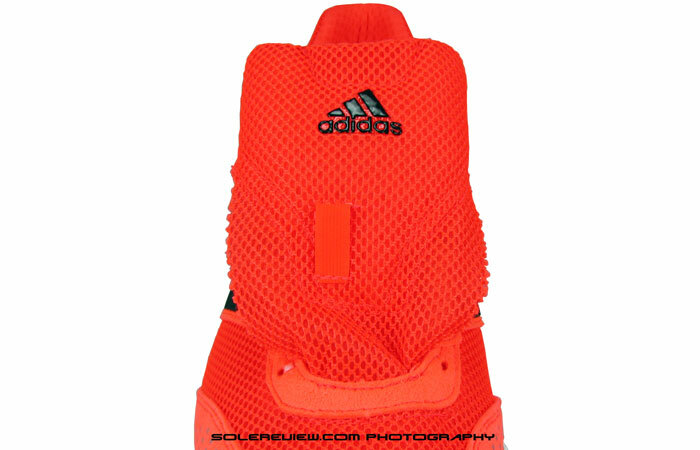 And when we see it from a manufacturing eye, Adidas might be using a very old pressing mold too. The molding lines under the forefoot and the Adidas logo isn’t very clear, suggesting that the metal compression mold might actually be of 2008 vintage. Metal molds age with multiple compression cycles, and the channels which give molding definition get blunt and chipped. The last numbers have changed from what was printed on the Adizero CS footbed, but the foam molding around those numbers has a certain roughness to it. Experienced manufacturing blokes will see this as a tell-tale sign of retro-fitted modification. The synthetic Suede which is named Tirrenina. The name reminds of us of Tiramisu, which we’ll eat as soon as we finish this review. The collar synthetic is another material shared with the Adios 2 of 2012 provenance. 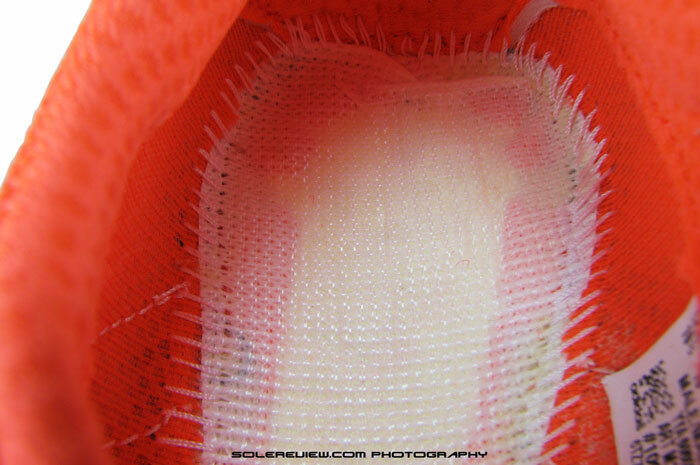 Mesh is unlined, and has excellent ventilation. The upper, as we pointed out earlier is a nod to the 2012 Adios 2 design. The well ventilated mesh is used in combination with a synthetic called Tirrenina Suede – basically a cluster of polyester fibers which can pass off as natural suede leather when it comes to hand feel. The tongue and collar are lined with another kind of mesh, which has got a smooth texture. The heel area is made of smooth synthetic (same as the 2012 Adios 2), and hardness of the counter points at use of an internal stiffener. Though the suede like panels look like they’re going to break-in over time, we see that as unlikely. Polyester fibers lack the natural, adjustable elongation (properties) of natural leather fibers, regardless of how close both appear in touch and feel. There are quite a few paper labels which come packaged with the Adios 2.0. 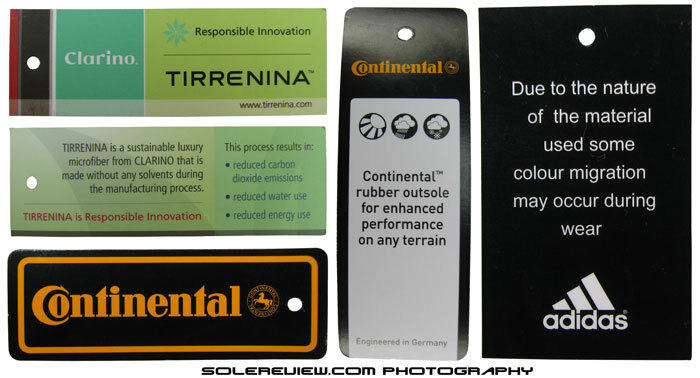 Couple of them calls out the features and benefits of Tirrenina and Continental rubber, while the third is a cautionary warning about potential color migration from the eco-friendly Tirrenina suede. Rain loving runners and general populace of the Pacific North West (USA), please note. Fit is extremely snug all over, with a shallow upper ceiling and a narrow instep. As with all Adidas shoes, you’ll need to do a compulsory half upsize when switching from same sized US brands. Not because the shoes adopt a different last, but just because there’s a difference in how the German brand converts its sizing. But the Adios is best worn snug, because the collar fit isn’t exactly great. Leaving some room ahead of the toes results in less than stellar heel grip, and moments of slippage become apparent during runs. The lace-loop placement is skewed to one side. Minimizes tongue slide. Buggy tongue design. The edges of the tongue fold under when worn, causing discomfort. And if you don’t want to upsize, you can’t go barefoot either. The tongue design is flawed and causes discomfort when running. The tongue is attached just to front of the shoe, so it runs free of the upper – kept from sliding by laces passing through an off-center lace loop. But that construction isn’t the problem, the tongue component itself is. The tongue is short and thin, so when you pull it while trying to lace up, its edges fold under. When it does, the coarser side of the mesh makes contact with your skin and is irritating. You can manually reach in when putting the shoes on and try to correct the folds; but the lacing is very long and there will be always be a portion of folded tongue tucked in somewhere deep inside. So what happens during and after a run? While in motion, there’s this constant sensation of a lump just under the top of the tongue. After a run, mesh shaped depressions show up on the bare skin. This does give ‘Feet You Wear’ a whole new meaning. Wearing a pair of socks dulls this effect vastly, but we’re certain that making adjustments on the tongue pattern will also translate into a more comfortable fit, even when worn with socks. Flat laces of old replaced with new tubular (and stretchy) type. Plenty of night-time visibility on the heel counter comes through a cluster of shiny dots. Smaller details include change of laces to a flat, tubular type, and increased night time visibility on the upper. The Adios Boost 2 ditches the loosely knitted, flat laces which had a cottony texture – used in all Adios versions so far and in the Adizero CS. 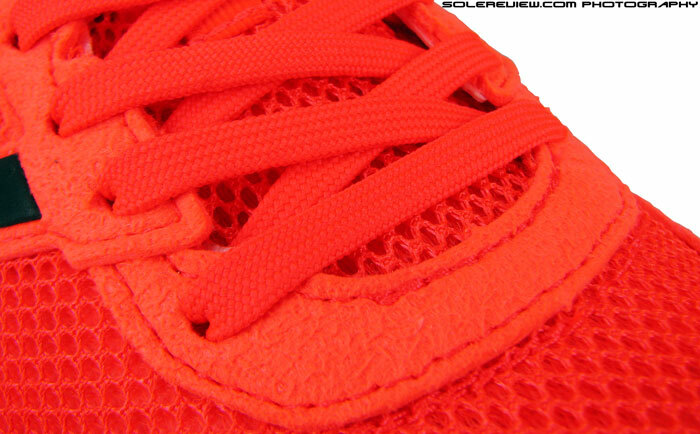 The new laces need to be tied tight, else they’re prone to coming undone because of its smoother surface. 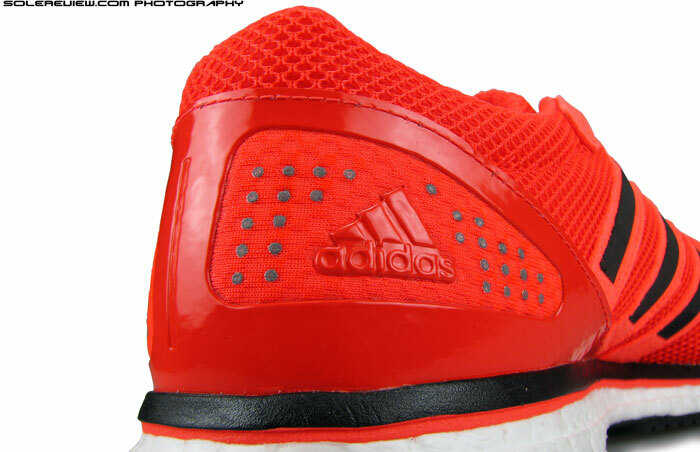 Reflectivity is cranked up on the 2014 Adizero Adios Boost 2, with shiny dots placed on either sides of the upper. The toe box alone has 66 reflective dots, while the heel has 75 – enough for low light running. The Adizero Adios Boost 2.0 has an excellent forefoot ground feel coupled with responsive heel cushioning, and it is very lightweight too (248 gms/8.7 Oz, US 10.5). The forefoot grip is stellar, and running fast in them just feel so right, so economical. Yet it does not impress us, its merits weighed down by the could-do-a-better-job tongue and the hard midsole under-arch. For a shoe which costs $140, every part of it should shine with distinction. If you don’t plan to run sock-less, and have a high arch, or are happy with the Adizero Boost 1, you could consider the Adios Boost 2.0 as one of your options. Otherwise, when it comes to racing flats, there are choice aplenty, both within and outside Adidas’ product line construct. Note on ratings: Our numeric scoring of 7.4/10 is based on a total of weighted averages. The attributes namely transition, stability and fit contribute to 69% of total scoring weight, which we see as more important than material (7%), cushioning (7%), traction (12%) and weight (5%). Hence the scores will not add up when simple average calculation is used. Yup, that’s how it used to be a few years ago! Please keep referencing the firmness and angle of midsole wall. This is probably the #1 thing that bothers my feet as they are flat and wide in the midfoot. Even “anatomical” shoes like the Altra Instinct dig in to my (lack of) arches uncomfortably. This is a nearly impossible characteristic to determine via online shopping, and when I do go into a LRS, I always remove the insole and take a quick jog so I can feel if that hard rim is present under my arch. Anything but smoothness there and I don’t buy the shoe. Thank you for the feedback! We’ll do so for all future reviews, and our sensory scoring reflects that too. Shoe was nice but man that forefoot jacked my feet up. I usually run nike and tried a Adidas for the first time and the balls of my feet were hurting and tight just after a 5 mile run. Sent em back though. And they are pretty pricey. The forefoot is pretty snug, agree. What speeds were you doing? As a flat-footer, it’s a pity that Adidas has moved from semi-curved last for my beloved adizero CS2 (circa 2006) to curved last for adios 2 and adios boost (adizero CS4 in this review is in semi-curved last). I hope Adidas can bring something that is on par with adios boost for low-arch runners. Thanks for the insight, didn’t know that! I just learned from my mistake from my adizero adios 2. Going to make comparisons with the Boston Boost? Yes, soon. Likely this month. Good to hear, not sure how they will fit in the lineup between the Adios and the Glide though…well in between obviously but in terms of how they feel? For that, you’ll have to wait for our review! But we have a feeling that’s going be pushed out to first week October, as we’re trying to fit the Kayano 21 in this month. Had been happily running with my new Glide Boosts for 6 weeks for easy/tempo even 5×1000/R1.5 at 10K-5″ and was thinking (as you do!) 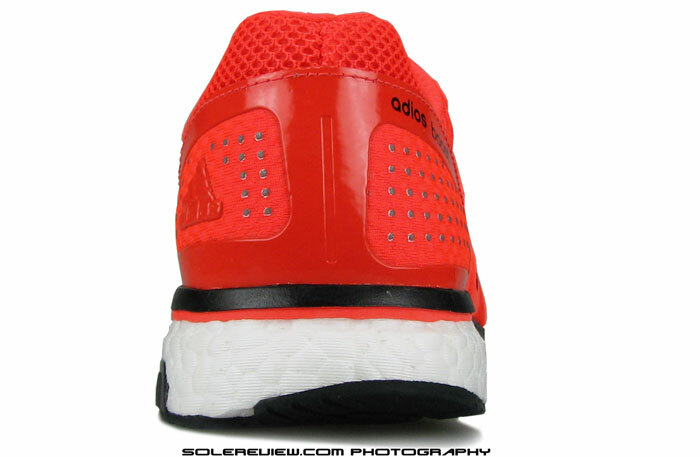 that I could use some “faster” shoes for speed training and possibly 10K races so I gave some decently priced Adios Boost v1s a try…Since the review says the sole is identical I take it they ride the same so I’ll share some thoughts here. Well they “ride” great, basically they feel like a “low-clearance” Glide, and were quite at home on a 10×400/r200 R-pace session I did on the track with some good ground feel and an ample toebox (almost too large compared to the Glide, especially with its stiffness). Not sure the Glides would have been a lot different honestly since I’m a forefoot/midfoot striker and don’t need much/any heel cushioning. What I don’t like so much is the upper that feels stiff/plasticky and not very comfortable overall, unlike the one on the Glide. I suppose that’s where some weight is gained as the Skechers GoMeb v2 have the same problem (possibly even a stiffer upper). It doesn’t sound like this has been improved on a lot in the v2 ? Thats a pretty big difference between the Adios and the Glide but honestly it’s not really noticeable, even if you have one on each foot. Unless the v2 has a vastly improved upper, I think I’m sticking with the Glide Boost for pretty much everything, especially since I’m not a lightweight at 175lbs for 6’3″ and “average” times (40’/10k). PS – Oh and my left posterior tibial tendon has been a bit sore since that session, but not sure that can be blamed on the Adios as it’s “sensitive” and the speed work can’t have helped! Good to hear your thoughts on the Glide and Adios 1. The Adios 1 Boost feels more roomy than the Adios 2 Boost. 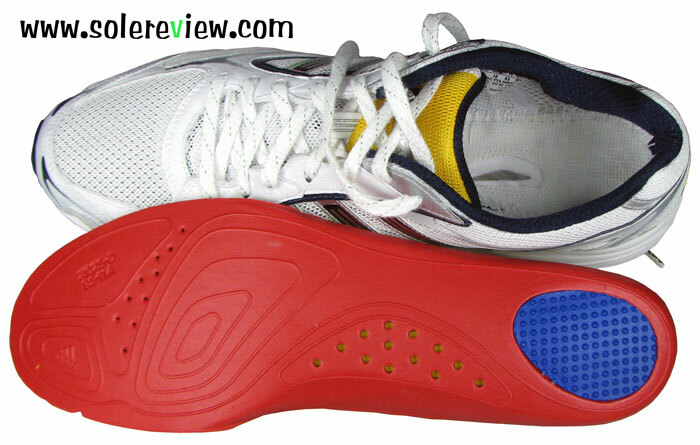 The one we reviewed has these big overlays on both sides of the forefoot, which reduces the degree of stretch. The Adios 1 had internal stiffeners which could bend out a bit. Yes, the upper isn’t that comfortable, we called the scratchy feeling out in our review. Should have been much better, considering that shoe is intended for distance speed runs. Makes sense to stick to the Glide Boost, given the nature of your footstrike. 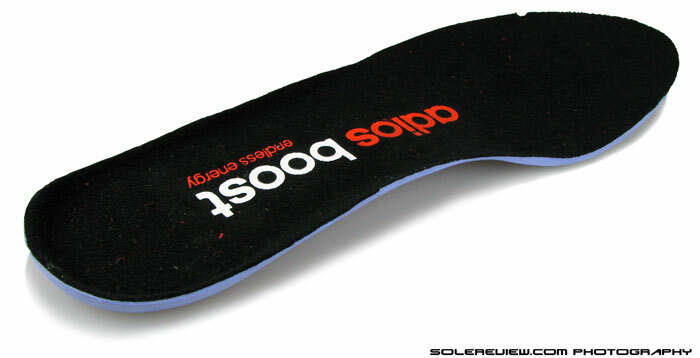 It is possible that your TP soreness is a result on your arch pressing down on the hard edge of the Adios 1 midsole. That would have resulted in pressure on the origin point of your PTT, streching it slightly short with forefoot loading. Great review. I had both the Adios 2 and Adios Boost. Both of which I experienced a mild soreness under my foot when logging more than 40 miles per week. I do seem to get around that problem by cracking my ankles several times a day. Could you recommend a racing flat or something vaguely similar in support of mild PF? The NB MR1400 v2, Nike Zoom Streak LT 2 and Zoom Streak 5 come to mind as potential alternatives, though can’t be 100% sure they’ll be grief-free. Can I please clarify sizing. I’m a US12 in most shoes – eg. Saucony Kinvara 5; Brooks PureConnect 3. Are you saying that I should size up to a US12.5 in these for a similar fit? Thank you! Ordering online so the extra advice appreciated. If you’re coming from Brooks, the same US (12 to 12) sizing will be same in length across both brands. That said, the Adizero (and most adidas shoes) run narrower+shorter, so a half up-size will put you on the safer side. However, that is just general advice, it is best to first try them somewhere (if possible) so you know exactly they fit your specific foot shape. I’m looking to use these for minimum half marathon distance so I don’t want them uncomfortably snug. Is the sizing advice similar for the Boston Boost? Yes, the Boston runs very pointy and snug in the front. Based on first impressions the molded heel area seems to be slightly narrower than Adios, pushing the foot forward. So need to half size up on the Boston Boost too. hey dear people of solereview! I informed myself through your reviews about what running shoes to buy, not to make a decision, just to be informed about what good shoes are around at the moment. I was most intrigued with the Nike Air Pegasus 31 and the Adidas Energy Boost 2.0. When I went to my local running shoe store to have my feet/my running style analysed and have someone who’s an expert advise me, they recommended two shoes: The ON Cloudsurfer and the shoe on this page, the Adidas Adizero Adios Boost 2.0, the latter of which I ended up buying, because it just felt good when running around the store (had this sort of barefoot feeling). Now, I had never even checked the review for this shoe before I bought it, and looking at it now (7.4), it seems to be a way worse shoe than the the Pegasus (9.4) and the Energy Boost 2.0 (9.1). My question to you now: If you were me, would you return the shoe and buy one of the other two? I just recently started running again after doing only strength-workouts for a year, I am not planning to run marathons, but just want to go running for fun, on roads and on trail, once to three times a week. I see myself doing 3-5 km per run, and I want the shoes to last a good while. I weigh 141 lbs, I have a medium (normal) arch, I am a normal pronator with a slight tendency towards underpronation and I have a normal heel strike. Which shoe would you recommend? Thanks so much for your help, your site is awesome! Sometimes we find it incredible that people from all around the world visit solereview! So grateful, and thank you for your support. Before recommending the Energy Boost or Pegasus, what has been your experience with the Adios Boost so far? Regardless of the rating, if the shoes are working well for you, perhaps you need not change them. The only drawback would be the lack of outsole durability – the Adios forefoot will get shredded on trails. For a shoe with similar racing feel but with a more robust forefoot, consider the adizero Boston 5, also known as the Boston Boost. Our review will be up sometime next week. You mean the Energy Boost? Great ride, but the tight upper fit might be a turn-off for some. Hi there, great review on these shoes. I went into a running store to pickup a pair of new shoes and it came down to these and the Nike Air Pegasus 31s. They were pushing me on the Adidas, and admittedly I loved the lightweight, barefoot type feel when I tested them, but ended up going with Air Pegasus since I’ve always had Nikes and trusted them more. I am second guessing my decision though as they feel a bit heavy and clunky. Previously I wore the Flyknit Lunar 2s and loved them, but they told me they were more of a lifestyle shoe than a true running shoe. Do you think these would have been a better choice than the Pegasus 31s based on my lightweight preference? I run about 15+ miles a week at about a 7 minute pace (either outside in the city or on the treadmill) and am 165 lbs. I also have a neutral stride. There’s also a chance I train for a half marathon in the near future. Let me know your thoughts if you can, and thanks in advance! Hi – yes, compared to the Adios, the Pegasus will feel heavy and clunky, as the Adios is a distance racing shoe, while the Nike is meant for slower paced running. We think a good in-between shoe would be the Adidas Boston Boost, which has an upper (design/feel/fit)and Boost midsole closely resembling the Adios, but the outsole has more rubber – making it a better daily, neutral trainer. If your preference is lightweight, then the Adios Boost and Boston Boost are definitely better than the Pegasus. Thanks. Any Nike models you would recommend (or others)? Just a personal preference, but not a big fan of the Adidas models. For example the Lunarlaunch model you reviewed looks good and lightweight, but it’s odd that it is not even on the Nike site (although it can be found online). Nike works in strange ways, indeed. Nike equivalent for Adios Boost? That’s easy – the Zoom Streak 5. Fits a little more wider (roomier) in forefoot and has better outsole durability. It might be Nike’s best match but I think they run quite differently. 🙂 On paper the Streak 5’s drop is just 2 mm more but the slope feels much steeper. At least that’s what my feet tell me and every foot is different. 😉 Anyway, both are great shoes! They are certainly very different, that’s for sure. But like you said, both of them are great in their own way. Hi there solereview – this is in reply to your post a year ago, but is very similar to my situation! Hoping you can help. I have the Pegasus 32, which are great for easy pace/long runs, as you say – but I’ve recently taken up 5k racing, and they don’t feel great for racing and any interval work (in fact my arches are pretty strained each time, as well as them feeling sluggish). Do you think adding in Adios Boost as a tempo/race day shoe would be a good idea? I *may* up to 10k or HM as a one-off, but my staple is going to be 5k for now (weekly race at Parkrun and training in the week). Bear in mind, I don’t really want to go pure flat race shoe, if possible. Very happy to hear about your PB in the SG6! And thank you for the kind words, appreciate it. After successfully using the Glide Boost 6 for everyday training (and possibly for my first Marathon next year), the Boston Boost 5 for tempo/HM races, I got the Adios Boost 2 for speed sessions/10k. A success as well since I managed to break the 40′ mark…for a few seconds 😉 Just as important, no blisters or any particular tendon/muscle aches. Thanks for the feedback. We’re also looking forward to reviewing the Tempo Boost early next year, let’s see how that shoe turns out to be. I just happen to be reading the comments section when your reply appeared about wiggle. Would you happen to know if the US Customs will be imposing any import tax/duties from shoes ordered from the site? I’m seriously contemplating on getting my shoes from wiggle and having it shipped in the US but I’m afraid that there will be some taxes that will be slapped on me since it will be coming from the UK. Sorry I have no idea. I’ve never used them and I see the company is UK based but their prices are in US$. Hi Albert, pleased to hear our reviews are of help! From the looks of it, late stage stableframe midsole – so could have neutral behavior. We could be wrong though. Have you had experience with the Hagio or Takumi Sen? Comparison with the adios boost? Not tried them, so no idea how those compare. I sized up and run barefoot in the Boost 2. The mesh feels coarse when I first put them on, but then I soon forget about it, so for me the mesh doesn’t pose a problem when running. I have not experienced problems with the tongue. I bought the shoes in an 11.5. I normally wear size 10.5 D in dress shoes. I have a pair of the Adios Boost 2 for racing and faster running days. I really love the fit and the way that the boost feels. My question is that I am looking for a lightweight trainer to complement the Adios Boost on easier days. I also run in the Ravenna 5 which I like, but am looking for another shoe to throw in. The Adios isn’t enough for me on longer or easier days but I sometimes want something in between for half marathon/marathon pace tempos. I have considered the Boston Boost, but am unsure of its softness which I might not like. I am open to any brand. I like the level of stability of the Adios just want a little more in the forefoot and a firm/responsive ride. Thanks for all of your reviews, they are so informative and helpful. The Nike LunarTempo might just be your thing. I just run a new PR in a half marathon at 1:30 with the Hitogami 2 but this shoes take a big toll on my calves to the point that I had to slow down the last 3k since my calves were to the point of cramping. I was wondering if changing to a shoe like Adios would allow me to still be as quick as with Hitogami without being so tough on my calves or should I consider Boston boost ? The heel to toe drop isn’t all that different across both models, so not sure whether adios Boost will fare any better. But are you absolutely certain the cramps are caused by the shoes? It will be useful to have a second opinion. Thanks. Well I have no cramps with the Ride 7 running a slightly slower pace but they are too heavy and don’t feel so quick. I was well prepared for that pace and have no pain or soreness after the race. I made sure to have enough salt also so I’m not sure what other options could be. Thank you for the insights, but really hard to say what’s causing the soreness. A respectable half marathon pace will come with variables of its own. I have been running for a while and training a lot in a pair of Asics nimbus 16 however they are just way too heavy for racing so I am looking for a lighter racing shoes. I had really good experience with some of Adidas’ trail shoes so I was looking there and now I am really stuck between the adios boost 2.0 and the Boston boost 5 (the Boston boost 6 is not available in South Africa). Any suggestions? The price difference here is negligible and I mainly race 5k – half marathon. We’d side with the Adios Boost – a better pace shoe than the Boston Boost. Thanks a lot. I got a pair and although I was a bit apprehensive at first because of a few reviews I was really pleasantly surprised. I took it for a 7km run to put it through its paces and being my first boost shoe it was a bit of a shock at first but soon got used to it. They were really light and responsive especially when compared to my earlier Nimbus 16 which now simply feel like mushy bricks on my feet in comparison. I haven’t felt any pain though the middle felt stiffer than I was used to but the combination of the bouncy heel and the torsion thingy made my turnovers a lot quicker and the whole shoe just felt a lot more responsive. The closest thing I can actually compare it to is when I got my first proper sprinting spikes. Thank you for the insights, Daniel. 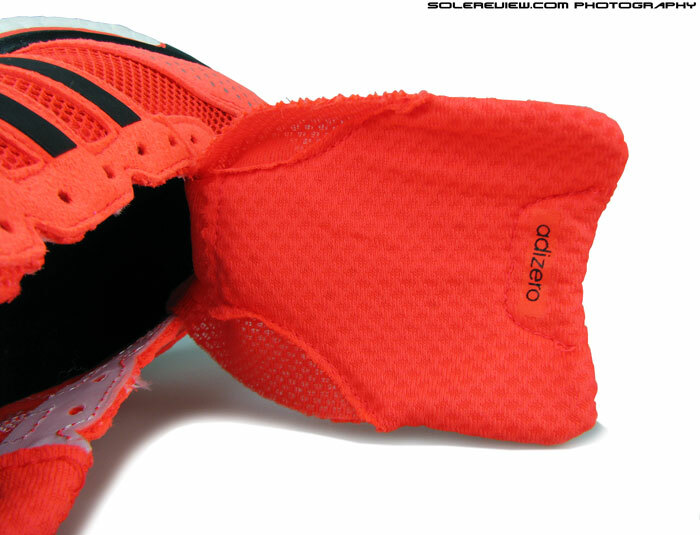 We had the exact same impression, that the adios Boost mimics a pair of track spikes at some level! How does the Shoe Size of Adios Boost 2.0 compare to Adidas Energy Boost 2.0? You need to get the adios 2 Boost in a half US size larger than the Energy. If you need the same amount of space ahead of the toes as in the EB, that is. Hi, I’m a 14year old runner and wondering if the adios boost has enough cushioning to serve runs up to 10k and 40-50km per week? What are you running in right now, and what do you like/don’t like about those shoes? The adidas adizero tempo 6. I underpronate and consequently the severe support on the tempo 6 has caused problems in the past. Also I’ve discovered in time that the EVA midsole has become firm and does not offer a lot of plush cushioning. In that case, try the adidas Supernova Glide 7 Boost. Thanks… they’re out in the US too now. Many factors at play here. Not only height, but total volume, outsole design and material, lasting/insole, etc etc. Hi, i am looking for a pair of Adidas Boost that suits me but i don’t know which one. I am a mid-foot and forefoot striker, I have a medium (normal) arch, I am a normal pronator with a slight tendency towards overpronation. I run 5- 10 kms per week. Do you have any ideas? Can I use adizero adios boost 2 or response boost 2.0 techfit ? Taylor, we’d recommend the adidas Glide Boost or Vomero 10 for daily training, and the Boston Boost or Lunar Tempo for fast days. 1) Which one would benefit me best in race (or training) environment – the medial post/support of 1500 or the supposedly magical cushion/bounce effect of the boost foam? 2) Which would last longer and can I get, say 700-800 km out of such a shoe? We would pick the NB 1500 – not sure of the V2, but the V1 was awesome, and the midsole/outsole doesn’t seem to have changed on the V2. The fit is more comfortable/consistent, and the cushioning is better spread over. The adios has Boost, but it’s pretty thin under the forefoot. If you don’t aggressively forefoot strike and take good care of the small outsole lugs, then the adios Boost will last longer than the NB 1500. So it’s a tie, really. If left to us, we’d say the New Balance. I am purvesh. Congratulation for being the best site for Shoe Reviews. Your reviews are so detailed. Its really awesome plus you guys answer each query posted by other user. Kudos and thanks to your effort. I would like your expert opinion on the shoes i should buy. I am looking for long distance, light weight, fast running shoes with ample of cushioning. Currently I run on the Adidas Marathon 10 Ng running shoes. I am planning to run a full Marathon next year. Please recommend few good running shoes options. You could try either the adidas Glide Boost, the Nike Vomero 10 or Skechers GoRun Ultra road. You mentioned in one of your previous comments that the selection of brands was limited in your location. Thanks for your prompt reply. Yes, selection of brands is limited in my location but I have access to brands like Adidas, Nike, Skechers, Asics and Reebok. Tough the latest model might not be available. But I could order it online. Out of the 3 recommendations which one would be your best pick?